You probably know Max Group as the $3 billion healthcare and insurance provider. I suspect those in Delhi will know of their recent foray into real estate, but I’d be really impressed if you picked them as a PropTech investor. I sat down with Sahil Vachani, MD & CEO of Max Group subsidiary Max Ventures & Industries (MaxVIL), Rohit Rajput, Chief Growth Officer and Ashish Singla, VP and Head – Investments, to learn more about the journey that led them to PropTech. RM: Sahil, when you joined the group in 2016 the goal was to create a powerful real estate brand. How has the first 18 months been? Sahil Vachani (SV): Over the last 18 months, my conviction has only grown. In that time, we have conceptualized, developed and delivered our first project 222, Rajpur in Dehradun – a high end residential project and we have sold 50% of our units. Our second project – Max Towers, Noida – is a Grade A Commercial Tower and will be ready for occupancy by March 2019. We have already pre-leased 50,000 sq feet to a premium Co Working Brand. In a short span of 18 months, to conceptualize, develop 3 projects over 750k sq ft and deliver almost 600k sq ft in addition to the fund raising that we have done is immensely satisfying. We have created the right foundations to grow Max Estates into a major industry player over the coming years. RM: But the group isn’t entirely new to real estate? SV: That’s right. Max Group has had experience in the activities of Real Estate since early 2000 when we started building the physical infrastructure first for our healthcare and then hospitality and senior living ventures. With our experience in building Max Hospitals, a pioneering facility for our Antara Senior Living community and our experience of creating successful brands like Max Bupa & Max Life Insurance, we felt well positioned to create India’s preferred Real Estate Company, one which positions customer experience at its core. RM: And what role will Max I. Ltd play? SV: Max I will drive, build and accelerate innovation in Real Estate by investing in starts-ups focused on developing cutting edge developments and technologies in Real Estate. RM: So, in a sense, this is PropTech and real estate development dovetailing? Rohit Rajput (RR): Today, the PropTech ecosystem in India has just begun to create an impact. At Max Estates we are obsessed with customer satisfaction. We believe PropTech is a means to achieve the same. We will leverage Max I Ltd to identify and possibly incubate start-ups working on the next frontier of Real Estate in India. Ashish Singla (AS): We are highly positive about the opportunity in PropTech. Our aim is to play the role of an incubator, investor, advisor or occasionally just a sounding board for ideas for entrepreneurs who are looking at disrupting this sector. We view PropTech from two lenses: Firstly, Real Estate as a Service – this includes capital light model of Real Estate focused on providing access to assets over ownership of assets and the emerging shared and rental economy. And secondly, Real Estate Technology – This includes companies that are at the intersection of Real Estate and Technology that disrupt the way we design, construct and transform the built environment. RM: What interests you most about PropTech? RR: The traditional model of Real Estate i.e. buy, build and sell is not too attractive now. With RERA being enacted, high standards of corporate governance will be required of any player. The market will consolidate leaving only a few large players who will likely harness PropTech in various forms to differentiate themselves and create a competitive edge. RM: So a large part of this is about future customer experience? RR: I believe that the Real Estate industry, currently largely driven by the adage “location, location, location”, will gradually shift to customer experience as the driver for growth. We recognized this early on and are incubating an internal venture “PULSE” which will focus on creating a positive customer experience in our commercial properties through best in class facilities management and community creation. AS: Real Estate in the last decade or so had become closed to customer feedback resulting in probably the lowest customer satisfaction score. This coupled with Lack of Trust and Transparency, Information Asymmetry, Poor Standardization, Multiple Intermediaries and Construction Inefficiency also led to the sector fast losing its tag as a good investment asset class. Within the world of Proptech, we have a positive bias towards companies that are solving these challenges and are keeping the customer at its core. RM: Are you looking to invest directly in PropTech or partner with others? SV: We are open to all models of collaboration including making direct investments. There are a few VC funds who are investing in PropTech however a pure play fund is still to emerge. We understand that we are at an early stage in the PropTech ecosystem and are keen to collaborate and co-invest with other funds interested in this space. We’re also keen to partner with, and possibly mentoring founders of, early stage technologies who are solving the challenges in real estate through pilots programs. RM: Are their particular sub-categories of PropTech that you will focus on? RR: We will not limit ourselves to a particular sub segment however we also recognize that it is important to prioritize. Considering Max Estates focus over the short term is primarily commercial real estate, we will focus our energies in PropTech in the same area. AS: The demand in Grade A offices and low vacancies will fuel growth of top rated commercial properties. With the growth in inventory and newer models of Real Estate as a Service, we expect that clients consuming this Grade A stock, will demand solutions for increasing the efficiency of their office space. This leaves an open window for startups which can innovate around smart building technologies and for companies which focus on improving the tenant experience. 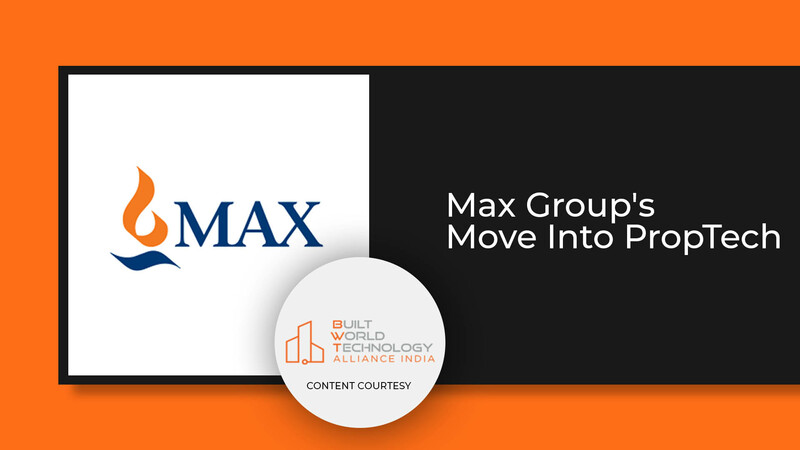 Max Group is a Gold Sponsor of BWT India 2019.